The POLARBEAR team produced the first direct measurement of the cosmic polarization induced by structure in the universe. Dark matter twists the polarization into a 'B-mode' signal at arc minute scales on the sky. The measurement rejects the possibility of zero B-mode power from gravitational lensing at 97.5% confidence (arxiv:1403.2369). This measurement was produced by the first year of POLARBEAR observations. This announcement came one week before the BICEP2 team announced their detection of B-mode power at degree scales, consistent with an energy scale for cosmic inflation of about 1016 GeV. This was an exciting week for Cosmology! The figure below shows the BICEP2 and POLARBEAR measurements. The POLARBEAR team is busy analyzing cosmological data while observations continue. Below we see a map of detected patterns in E-Mode polarization in the Chilean sky. Understanding these patterns will hopefully shed light on the behavior of the early universe. The POLARBEAR experiment achieved first light in Chile on January 10th, 2012 with observations of Saturn. Below we show signals from two polarization-sensitive detectors in one array pixel. 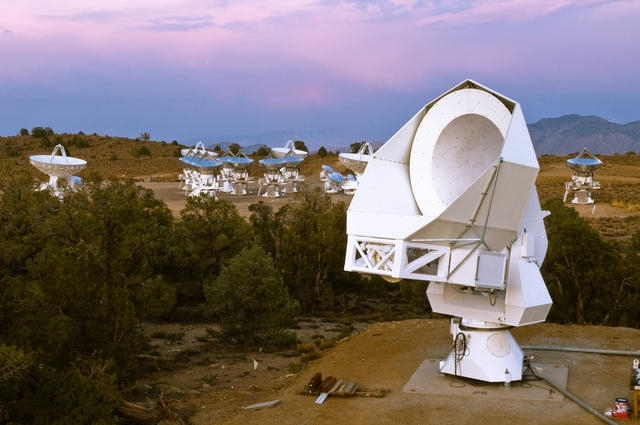 To the right, the 1284-bolometer array is being installed. At the bottom, a beam map from Jupiter is shown. The team is currently preparing the system for science observations in April, when weather conditions in Chile become suitable. Engineering run has been successfully completed at Cedar Flat, CA! Next stop: Atacama desert! The Polarbear telescope installation is now complete! The installers from GD-SATCOM have signed off on a working telescope. Polarbear is currently situated at PAD 25 amidst the CARMA array.